Aircraft manufacturer. Born January 17, 1886, Macksburg, Iowa. Died December 5, 1955. 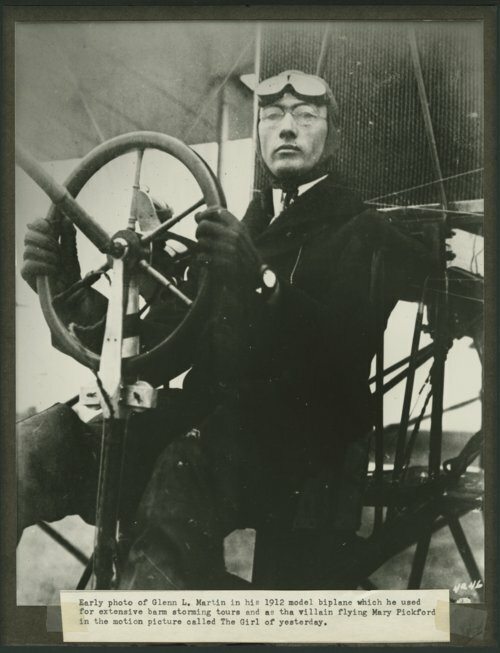 Aviation pioneer Glenn Luther Martin was born in Macksburg, Iowa, on January 17, 1886, to Clarence and Minta Martin. At Martin's birth his mother knew he was destined to fly. She had a dream two days before his birth in which she flew over the prairie, waving to all her friends. When he was two his family moved to Salina where his father operated a wheat farm and worked as a traveling salesman. At the age of six the family moved to Liberal where his father managed a hardware store and farmed. There Martin began building box kites. In the family’s kitchen, he constructed the kites that he sold to friends for 25 cents. He used the Kansas wind to propel a toy wagon with a sail. He adapted the sail to increase his speed on his bicycle and his ice skates. Just a few years later Martin felt he was old enough for a kite. Since the family was poor, his mother encouraged him to make his own. He did, using an example he found in a magazine, and soon had the best kite in town. The other children in town, seeing how well his kite flew, quickly requested he produce kites for them as well. Here Martin started his first business, selling kites for 25 cents to the boys around town. In 1903 word came that two men had flew in a machine of their own invention. Martin became very excited by this. He scanned all the papers for any word of the Wright brothers, and soon found a picture of their flying machine. Upon seeing it he told his mother, "Why this is just a kite with an engine in it. I can build kites, and I can build engines, so I am going to build one of these airplanes and fly it myself." So he set out to build his first plane. Martin attended Kansas Wesleyan and gained an interest in motor cars. In 1905 the Martins moved to the West Coast where Glenn continued to pursue his interests. Upon arriving in California he began to learn the mechanics trade, and soon ran his own garage. Not having any education in aerodynamics he first set out to build a glider. Having successfully built this he began work on his plane. For 13 months he worked out of an abandoned church, night after night, building his plane. Finally on August 1, 1909 he rolled it out of the church and to a nearby field. There he became the third man to fly a plane of his own invention. He made flying exhibitions and set flight records. In 1912 he founded the Glenn L. Martin Aircraft Company in Los Angeles, becoming the youngest aviation manufacturer in the world. He merged with the Wright Company in 1916. In order to promote his planes he began working a barnstormer and performed stunts in motion pictures. Martin would return to Kansas for a series of barnstorming flights. He eventually merged with the Lockheed Corporation, forming Lockheed Martin, a major U.S. aerospace and defense contractor. In 1917 he founded a second company, which merged with the American-Marietta Company and later became the Martin-Marietta Company. During World War I and II Martin's planes were in high demand. In his later years he even predicted that someday man would fly in rockets outside the earths gravitational pull. He was highly doubted at the time. Martin died December 5, 1955, after having become one of the early men to fly, a major manufacturer of airplanes, and even predicting the future of air travel.